As a big fan of JRPG, I’m glad that I was chosen to talk about this game! The Legend of Heroes is a true RPG game, like the old time ones! 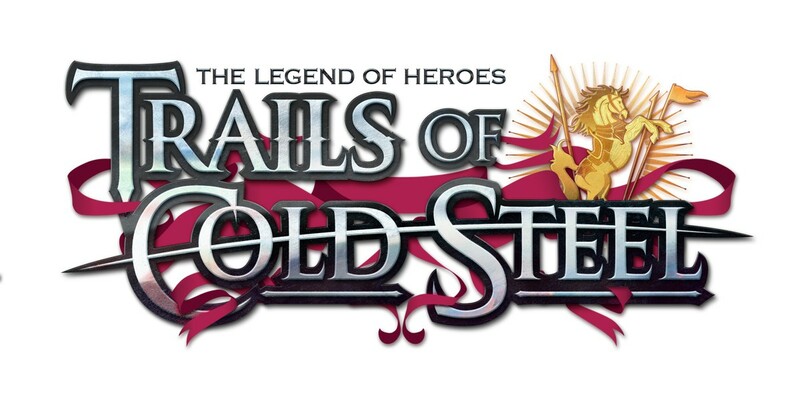 The Legend of Heroes: Trails of Cold steel 1 and 2, were released in 2013 and 2014, its remastered edition will arrive for Ps4 on 26/03/2019. This time with an option to hear the original Japanese voices from the characters (which is awesome! Even though I would rather go with the American version, somehow the voices in English fits the character better, I tend to get that feeling that the Japanese voices are too exaggerated/overdramatic), also whoever choose to use the American version of it will have more than 5 thousand new lines that was only available for PC. Enough with the cheap talk hahaha let’s start this review! Inside “The legend of heroes” series we have a game before called “Trails in the Sky the 3rd” and even though it has a lot of events that are connected to “Trails of Cold Steel”, it is not necessary that you play it to really enjoy the history. 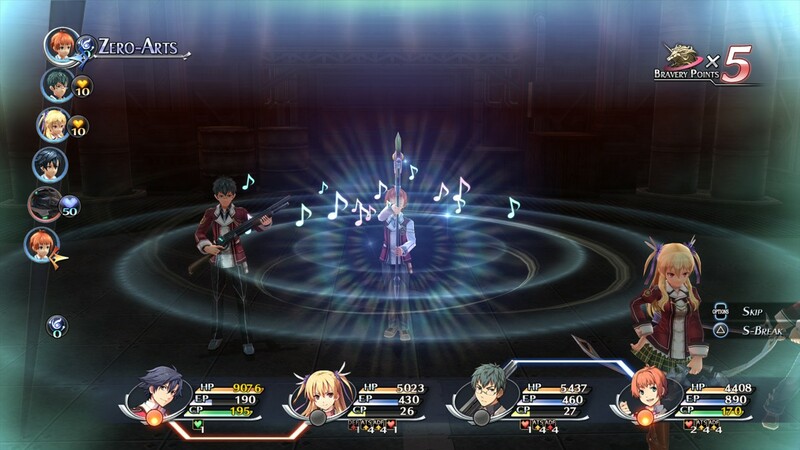 The game ‘’Trails of Cold Steel’’ is a game that was created back in 2013 and made a transition between 2D graphics from the past games, created to run in a compatible software like the PSP, to 3D. The main history is quite simple (even with the game main plot being political issues), you’re Rean Schwarzer, a newbie at the “Militar Thor’s Academy”. After finally arriving in the city of Thors, Rean realises that he was located in a class that is a mix between nobles and peasants, “Class 7”, where rank means nothing but skill means everything, it’s weird because the game shows you that there is a CLEAR separation of classes in this world. Each character has a great background and it is very interesting to knowing and interacting with each one of them. 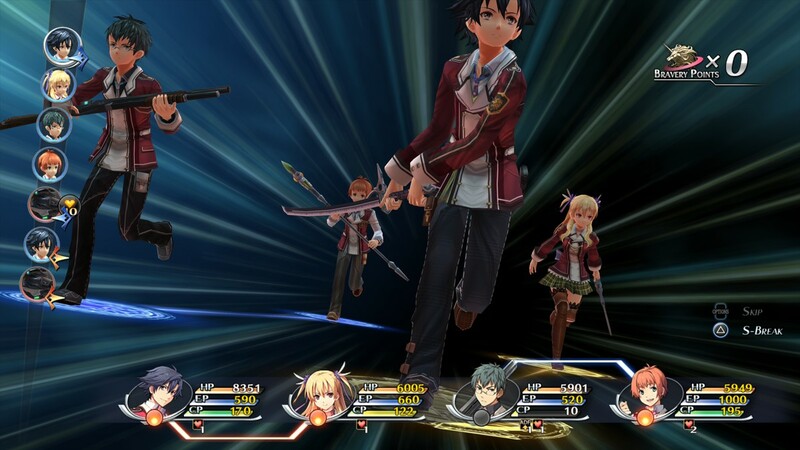 Trails of cold steel it is a VERY LONG game! Which for me is great, it can take MORE than 50 hours to finish it (without the turbo mode), the game has a lot of dialogues and histories, so for the first 8 hours of the game you will not have much action in fights. Be aware that Trails of Cold Steel has a VERY SLOW beginning. However, spending time making friends and developing the friendship, playing cards while travelling in a train on a school trip/ field trip (the best missions) are examples of what makes this game so unique. The game has a grading system that changes with each main mission, extra missions and actions that you do during the chapter. Even though this system could seem interesting, keep in mind that the advantages are not so great… and you won’t take good items for the next game. So my suggestion is to enjoy the game, not giving too much thought to the grades. Okay? The game has a “relationship” system allowing you to have a bromance if you want to. Between the game events, you have limited free time and you can decide with whom you will spend it, usually with only 2 or 3 people. The battle system is based on turns and the characters have an area that they can walk around it to have a better strategic position. The attacks can have a damaged area that can hit several enemies at once AND combined attacks if you stay sharp and don´t miss the opportunity (I’ll talk about this in a bit). The “Orbment” system, gives you “superpowers” to equip on your characters, named “Quartz”. The thing is… the game forces you to choose between Quartz giving you magic attacks (Like Fireball), or Quartz that buffs your mate’s stats (Like +Speed), the second option being more useful during the most parts on the game. There is some Quartz that gives you both benefits… but these are hard to get… at least in the first half of the game. Between “Arts” (or Magic) and “Crafts” (or Specials), I´d rather use Crafts! They have AoE and higher damage without delays on its execution. The linking system is my favourite! Where the characters complete each other’s attacks and give bonuses! In addition to it, they even do bigger damage if their relationship is good. To sum up, the battle system is cool! It does have some stuff to improve… but the overall is good and it can get very intense in some parts of the game. This is a hard area to talk about because that´s definitely not the strongest point of this game, due to the fact that it was made to a portable console… The animated parts (The Anime part) is perfect as it should be, but the 3D part is something you should not expect much. 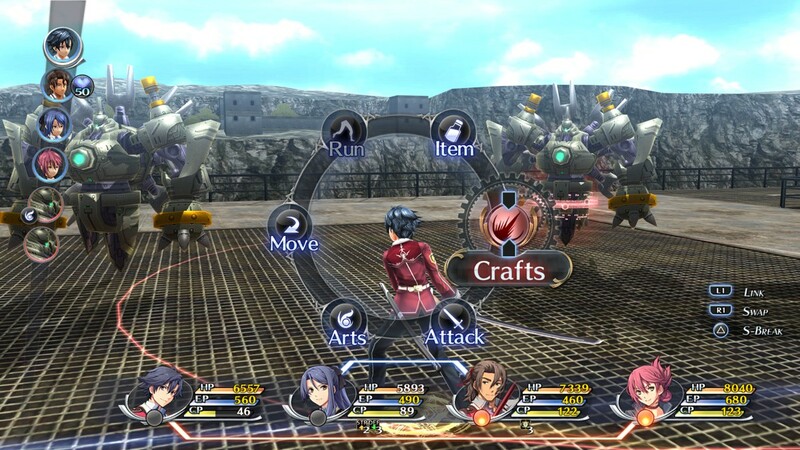 There are a bunch of parts in Trails of Cold Steel´s world that doesn’t transmit any realism… there are simple sandboxes which you go from point A to B, so don’t expect a super interactive and immersive world. The OST is good, unfortunately, it does not have a memorable touch, after a while they just mix to the background and you end it up by ignoring it. Trails of Cold Steel is a game that does not bring anything revolutionary but it does give a great story and the relationship system is awesome, all the characters are very charismatic (The Teacher is the BEST hahaha). Thinking of the game as a whole, I´d totally indicate to everyone who loves a good JRPG but I´d never indicate for someone who never played anything similar before.